Just East of Amsterdam Central Station, following the Oosterdokskade, there has been a lot of development. 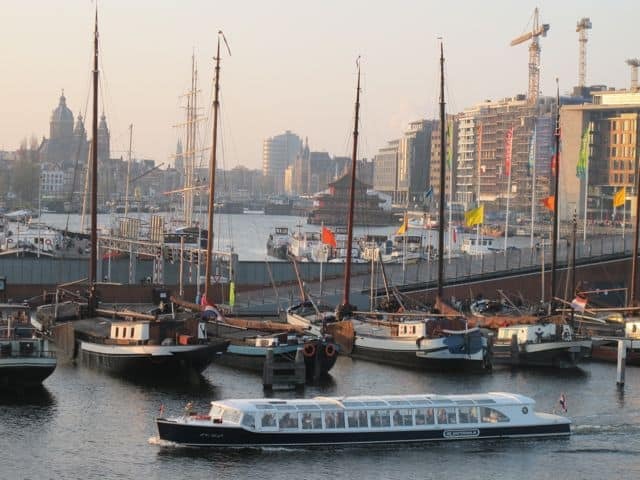 Interesting architecture that has arisen here include the Amsterdam Doubletree hotel, the public library OBA and the Amsterdam music conservatory and Science Museum Nemo. Follow the instructions in the article and you’ll enjoy a nice Architecture Amsterdam tour. Have a break to enjoy a drink and food at the popular venue Hannekes Boom, a café with a beautiful view over the water. This tour takes about 45 minutes walking. Standing with your back toward Central Station, go left, towards the east. Follow the no-cars walking /biking zone and bridges and watch the new buildings in this recently developed area. The east of Central station has undergone a complete metamorphosis. All of the old buildings have been torn down. The first building you will see is the Doubletree Hotel on your left hand side. Following the bridge, you’ll find the floating Chinese restaurant on your right. The Sea Palace is the first floating restaurant in Europe and has been around since 1984.With its Chinese kitsch interior and its over the top décor you can enjoy a real ‘Dutch Chinese’ meal. Hardly surprising that the Sea Palace Chinese restaurant is the biggest restaurant in Amsterdam. This East Architecture tour in Amsterdam is also available as an audio tour for your smart phone. Download the app and the tour for free. More information about What’s up audio tours. On a whole different level, but also floating, it’s the Tricky Theater Restaurant. Food, magic and theatre all on one boat. On Saturday night a three course menu comes with a magician show. Great for kids. Modern architecture in Amsterdam: public library at Oosterdok. On the left side, the spectacular main library can’t be missed. Feel free to enter and wander around this beautiful designed building, with its large open spaces and fantastic views on Amsterdam from the top floors. After strolling and picking up a book here and there, or going through one of the 200 different newspapers, you can have a drink and food at the restaurant on the top floor or just lounge about in of the sofa’s (and secretly take a nap…). Next to the library is the Amsterdam Conservatory. The building was opened in 2008 by Queen Beatrix. The design was inspired by Japanese houses, whereby the halls and stairs are all on the outside of the building and the rooms are in centre of the building. This way, the music students will not be disturbed by outside noises. Many free concerts by young talented students on week nights. Check out the concert calender. Now, you can take either of the two bridges. One goes towards Nemo Science Center. The copper green ship-like design was opened in 1997. It stands on top of the IJ-tunnel. The building was designed by Italian architect Renzo Piano. The roof of the building is a large and very sunny terrace which in summer has been made into an entertaining city beach. Bridge towards Nemo Science Museum Amsterdam. The other smaller, ‘turning bridge’ leads you to ‘Hannekes Boom’. This new bar and restaurant (open since July 2011) has become hotspot of hip Amsterdam. The spot has been known as Hanneke Boom (Hannekes Tree) for centuries, as it marked the small harbour where vessels would enter the city. Amsterdam bar and restaurant Hannekes Boom. At night, the entrance would be barred by letting a tree float in the water. Hence the name Hannekes Tree. The ‘new’ restaurant has been built solely out of recycled building material. All products are local and on the roof there is a herb garden. The new Hannekes tree is 21st century proof. With its sunny terrace along the waterfront, excellent views, good prices, politically correct food and regular parties, it’s not surprising Hannekes Boom became popular fast. Amsterdam Tower Montelbaan, remnant of the defence wall. From the Nemo Science Center you can turn inwards the city again, crossing the main road and walking along the Oude Schans canal towards an old tower, the Montelbaanstoren. Originally the Amsterdam tower Montelbaan was built as a defense of the city in 1516. Because of the unpredictable tower bells (they would spontaneously start to play at random times), the tower is is named Crazy Jaap. Even Rembrandt liked this crazy tower, as he painted it. Now turn right and you will walk right into the Nieuwmarket area. This is the end of the East Architecture Amsterdam Tour.